Draw snow under Solipskier to gain speed, do tricks and hit bonus gates. Avoid the jump chasms and red gates and tryto get the highest score you can! Share scores with your friends to see who's the best. Try drawing long downslopes with short inclines on the end to gain speed and neccessary altitude (for higher gates). If you pass through a green gate while airborne you'll get a multiplier and speed boost. The faster you go the more points you will rack up. "Great sound FX, really cool graphics and the gameplay is excellent!" "This game is astonishing in its freshness!" "Such a solid and fun game! I really love every aspect of this game." "This game was 100% fun." 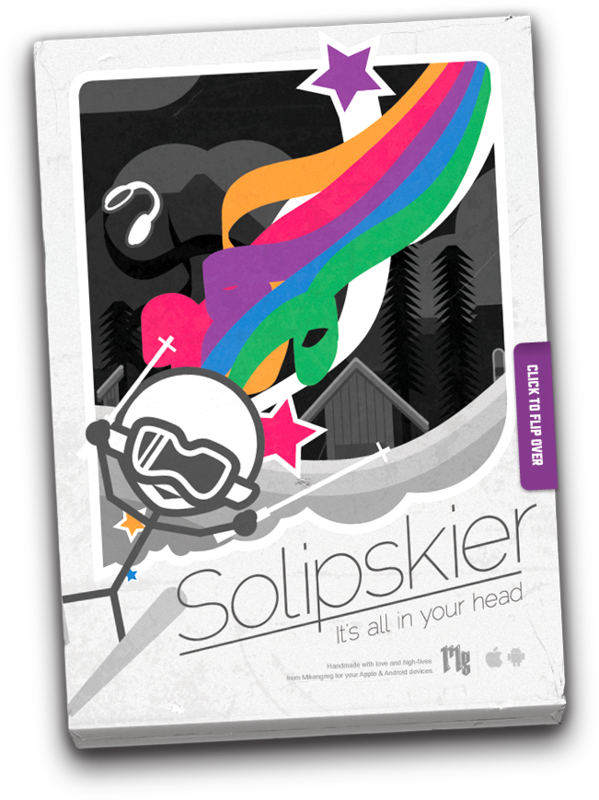 Solipskier is available for the iPhone/iPad as a universal application no matter how many devices you want to put it on. It's also now available for all Android mobile devices. We will not stop until we conquer every mountain on Earth! We've put a lot of time and love into this game and we hope you dig it. Check out the links on the left there to get the game on your phone.